Community Heritage Partners works to build a future informed and enriched by the wisdom and traditions of successful human built environments. Since our 1985 founding, we have drawn on architecture, planning, urban design, historic preservation, and real estate strategies to invent practical and innovative design solutions, and to find new active uses for under-utilized properties and older buildings. We design plans for both new construction and renovation and restoration work for old and historic buildings. Our solutions for new construction or renovations, always aim to regenerate older places and build successful new future spaces designed for living, working, learning, and growing. Community Heritage Partners is an award-winning architecture, urban design, and planning practice focused on the details of planning, design, preservation, and development, which ultimately lead to Urban Regeneration. With our multi-disciplinary background and expertise in planning, architecture, urban design, building science, sustainability, graphic design, property and historical research, historic preservation, public policy, and real estate development, we can identify and bring together the key pieces of the project puzzle that can make your project a successful reality. Along with Community Design Works, our property development and management company, we design and oversee the particular spatial, social, environmental, and economic aspects of property design and development, to ensure the right mix of continuity and improvement, extending the best of the past forward to an even more positive future. We are known for collaborating with clients, municipalities, technical consultants, investors, lenders, and construction contractors to identify and work out affordable, buildable solutions in some very challenging circumstances. Frequently, when other architects have been unable to visualize and propose feasible, affordable solutions, we’ve stepped in and designed ways to move projects forward. We are recognized for working constructively with diverse community organizations to achieve win-win solutions that can bring project proponents and community quality of life groups together with shared development solutions. For more than 30 years, the firm has successfully completed projects across the American eastern seaboard, ranging from Charleston, South Carolina to Portland, Maine. From detailing underground moisture controls to stabilize an historic cathedral, to urban development plans for a new food and farmers market district in a central downtown; from the small-scale repair and renovation of older houses, to the rebuilding of older commercial districts, our work always addresses the technical, aesthetic, economic, and community engagement challenges that mark the difference between old places left behind and places that are regenerating, where new life and investment are growing toward a brighter future. We strive to create affordable architecture, worthy to be built, that will add genuine value to every place where we work. Our design approach integrates social, economic, and environmental design principles into every project. Construction without real architectural design to guide it usually produces investment that disregards local sense of place, bypassing promising opportunities and permanently damaging a community’s development potential. The best new construction design grows out of a considered understanding of place. It is ideally drawn from some study and knowledge of the older architecture that developed historically on that landscape. We believe that every place has some inherent characteristics – often they are latent, unknown or unrecognized — which can be rediscovered and drawn upon to strengthen and rebuild local quality of place, to make it someplace special. The secret to finding this is our ability to observe and to listen to what is there, and then to design the right seeds of construction that will add value, encourage growth, stimulate broadened renewal, and further reinvestment. We believe that with the right approach to town planning and architectural design, any buildings, communities, neighborhoods, and public spaces can become better places for people to live, learn, work, grow up and grow old — places they can truly call “home.” Successful planning outcomes require deliberate inclusion of community interests through well-structured community participation in every decision-making process. Community leadership is obligated to include and facilitate citizens’ involvement in all planning, development, and investment activity, and we are experienced in creating and managing that process. We strive to find development solutions that will balance new economic opportunity with the retained, and often still latent value of older spaces. We know how to solve the complexities of older structures and materials, so they can remain alive and useful, adding value to our lives and communities, and so they can continue to survive for the use, pleasure, and community enrichment of present and future generations. With the right approach to development, architecture, planning, and preservation can come together to make the most of any new development project. Our years of practice in downtowns, as well as our own personal experience as real estate developers, informs our design advice to developer and community clients. We are often able to envision and recommend alternatives to conventional development which can produce greater long-term social, economic, and environmental benefits for property owners and their communities. Gene Aleci has more than 40 years of architectural experience in planning, design, and construction documentation work for new construction and existing building renovation projects. His architectural work experience has ranged from construction documentation work for a multi-million dollar high-rise waterfront development with underground parking structures [protected by floodgates] along the Potomac River in Washington, DC, to the adaptive use and renovation of old and historic buildings, including schools, post offices, cathedrals, farmhouses, and warehouses, as well as residential alterations and new construction, in places stretching from Charleston, South Carolina, to Oil City, Pennsylvania, and Portland, Maine. 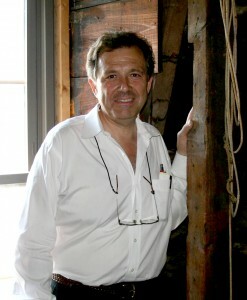 A native Pennsylvanian and graduate of the University of Notre Dame’s School of Architecture and Rome Studies Program, his academic concentrations combined urban studies and historic preservation. Since 1980, Aleci has held architectural licenses in several states. He has also been qualified for many years under federal requirements for the practice of architecture on certified Historic Tax Credit projects and National Register properties. He was certified as a planner by the American Institute of Certified Planners in 1998, and as a SEED Architect (social, economic, and environmental design) by the Public Interest Design Institute in 2012.